Majestic wants all of their customers to realize just how important it is that you have a chimney that is capable of properly venting itself. 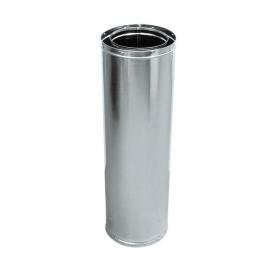 The 36 Inch Double-Wall Wood-Burning Chimney Pipe Length is just the needed tool to get this job done and get it done right. Equipped with a snap-lock connection designed that is intended to be both easy to install as well as so solid and stable that it will last for a long time, why would you want to go anywhere else when you an have it all with this item? Can I cut the chimney pipe to fit? This chimney pipe can not be cut. Top of the heap when dealing with courteous helpful persons at eFireplaceStore.